Hamsters are tiny creatures with a passion for hoarding food -- so it's up to you to ensure you're feeding just enough. 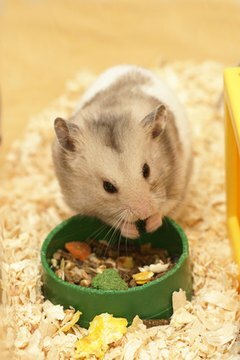 Because hamster food is readily available at pet stores and supermarkets everywhere, keeping your hamster well-fed shouldn't be too much of a chore. As long as you're willing to provide a fresh array of veggies and a supply of well-balanced dry food, Fluffy should be a happy pet. Ideally, your hamster should be eating a combination of dry and fresh foods to ensure he gets all the nutrients he needs to stay healthy and strong. Dry hamster food or pellets contain all the vitamins hamsters need. Since they don't spoil, you don't have to throw away the pellets Fluffy doesn't eat in a single day. The Humane Society of the United States recommends feeding about 1 tablespoon of dry food a day, no matter what type of hamster you have -- as both the smaller types and the bigger breeds need about the same amount of calories to stay healthy and avoid getting too fat. Fresh fruits and vegetables should be considered extras you can feed on top of the dry food. Don't replace dry food as the main part of your hamster's diet. Always give fresh food in small amounts -- a small slice of fruit, a baby carrot or a quarter-leaf of lettuce -- to avoid the hamster's overindulging or the food going bad. Your hamster will try to bury anything he can't eat right away, forcing you to go digging for spoiled food pretty soon. If you want to give your hamster treats, do so occasionally and in tiny quantities. Hamsters will get fat if you overfeed them. Good treat possibilities include small pieces of bread or sugar-free cereal, a rare raisin, and hard-boiled egg pieces -- hamsters can eat both the white and yellow part. You can also get your hamster a "mineral lick," basically a small piece of stone-like treat high in calcium. Hamsters can gnaw on these, keeping their teeth in good shape in the process. You can also get chew sticks made especially for hamsters to keep their teeth in good shape. The best way to offer water to a hamster is to use a water bottle. This prevents the water from spilling, which certainly will happen if you use a water bowl, and allows you to monitor how much Fluffy is drinking. It keeps the water clean from bacteria, which would otherwise make your hamster sick. According to the Peoples' Dispensary for Sick Animals, hamsters drink about 10 milliliters -- or about 2 teaspoons -- per 100 grams of body weight per day. Hamster can weigh up to 7 ounces, or 200 grams, depending on the type. Southern Hamster Club: What Can I Feed My Hamster? What Food Does a Camel Eat? Can Dwarf Hamsters Eat Dried Apricots?